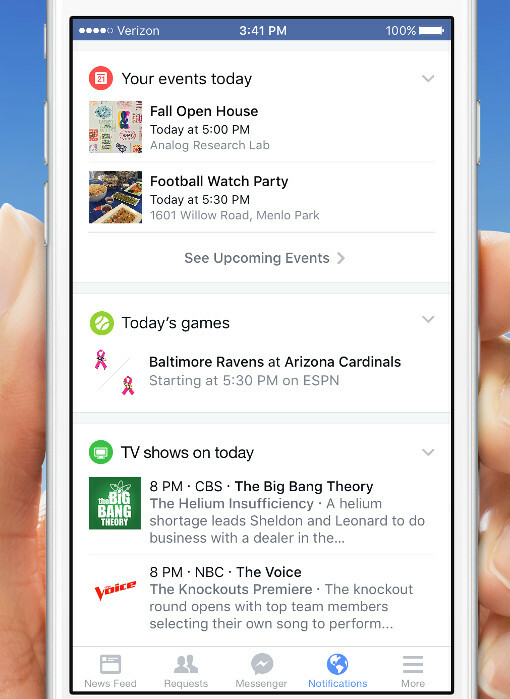 A personalized notification tab for Facebook's mobile app will organize customized information such as birthdays, sports scores, TV reminders and upcoming events, Facebook announced this week. Trending news posts will have their own card in the notifications tab. You can customize what's displayed on each card, add more cards at the bottom of the tab or remove cards. The notifications are grouped into cards similar to Google Now’s cards. Customization allows you to choose not only what does and does not appear on notification cards but how it's displayed. You can decide the best arrangement of the most important notifications that you want to see on the tab. Card notifications can also be tailored to your current location. For instance, find out what’s going on in the news and local events in your current city, get the latest about the weather (including severe conditions) in your area, see what movies are showing in theaters near you and get a list of nearby bars and restaurants (with links to their respective Pages). To use the location-aware notifications, you'll need to enable your Location History, which some privacy-conscious users are hesitant to do. Find out how you can improve your privacy on Facebook with our comprehensive guide. The update is being pushed out gradually to U.S. users of the Facebook app for both Android and iOS. If your update hasn't appeared yet, it should pop up soon. When you do get the update, your current notification settings will remain in effect until you change them. Want to use Facebook like a boss? See our post on 10 cool Facebook tips and tricks. Also stay tuned to our ongoing coverage of Facebook news and updates.